Dissolve baking soda in water. Add to creamed mixture. Roll dough out thinly. Cut with large cutter and cut centres out with small cutter. Avoid having too thin a border as these break easily. Place cut-outs on baking paper on a tray. Bake 180°C for about four minutes. 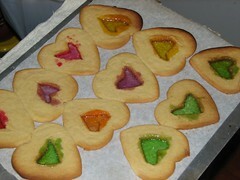 Remove from oven and add a generous amount of crushed sweets to centres. Bake for an additional 2-3 minutes until sugar melts and bubbles; and the biscuit is lightly browned. Remove and let centre harden before removing from tray. Store immediately in air-tight container or centres will become soft and sticky. Serve with a dusting of icing sugar (snow).